Jackets, Collections, Welcome Sign, Wooden Boxes, USMC Cats. Paws & Salute The U.S.M.C. Since their founding during the American Revolution, the United States Marines have defended our nation and traveled the world on its behalf. Their dedication to the Marine Corps Values of Honor, Courage and Commitment have won admiration at home and around the world. Now, you can honor Marines past and present with the USMC Semper Fi Cuckoo Clock, featuring military artwork by acclaimed artists Glen Green and James Griffin. A first-ever limited edition available exclusively from The Bradford Exchange, this striking mahogany-finished cuckoo clock features precision quartz movement to ensure accurate time all the time. 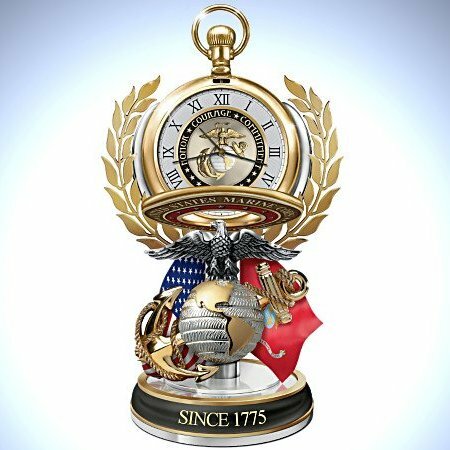 Every aspect of this clock pays homage to the Marine Corps, from the famed Eagle, Globe and Anchor insignia on the top to the motto "SEMPER FIDELIS" on the bottom. It bears a Marine Corps emblem on the clock face and brass-toned metal pendulum. The clock body salutes the Marine Corps' naval tradition and storied history with its handsome traditional styled case and mahogany finish. 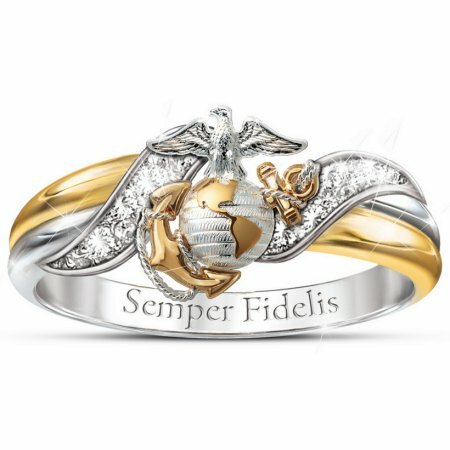 Sculpted versions of Old Glory and the Marine Corps flag flank the face, while handsome artwork of the flag raising at Iwo Jima and a Marine in Dress Blues completes the design. An American eagle emerges on the top of each hour to the tune of "The Stars and Stripes Forever" for the perfect finishing touch. 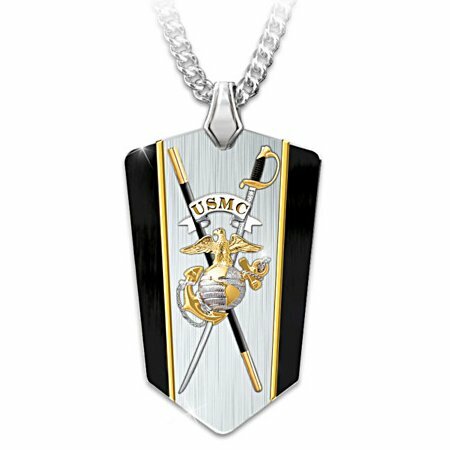 Strong demand is expected for this USMC home decor, so don't wait. Order now! From sea to shining sea, the United States Navy is a powerful presence, daily preserving the strength and spirit of liberty that our grateful nation holds dear. And if you have a sailor in your family, the Navy motto "Non sibi sed patriae" truly has special meaning. Now, a limited-edition musical glitter globe handsomely salutes this sacred motto that your Sailor and family live by. Introducing the Proud Navy Family Glitter Globe, exclusively from The Bradford Exchange. Inspired by the Navy emblem, the handcrafted, fully-sculpted golden centerpiece shines with silver-plated accents, surrounded by swirling glitter and silvery stars. On the Navy blue and silvery base is a gleaming banner that reads "NON SIBI SED PATRIAE" (Not for self, but for country), proudly flanked by stars with the sentiment "Proud NAVY Family" showcased below. This bold Navy collectible tribute plays the beloved tune "Anchors Aweigh" for added pride. Strong demand is expected. Order now! Honor. Courage. Commitment. That's what the United States Navy is all about. And each member of the Navy shows this day in and day out. Now, display your pride and gratitude to the brave men and women who serve our country with the United States Navy Cuckoo Clock, exclusively from The Bradford Exchange. This striking mahogany-finished cuckoo clock features precise quartz movement to ensure accurate time all the time! Measuring nearly two feet high, this United States Navy wall decor showcases a mahogany-finished wood toned clock body embellished with stars and symbols of service as well as the words, "HONOR COURAGE COMMITMENT". The swinging brass-toned pendulum bears a Navy emblem while decorative weights are shaped like anchors. Plus, an eagle emerges on the hour to the tune of "Anchors Aweigh". Strong demand is expected for this limited-edition timepiece, so order now! From ancient times to today, chess has been used by the military as both a metaphor for - and even as training for - the art of warfare. Now it seems only fitting that this classic game honors the greatest military force in the world, the United States Marine Corps. 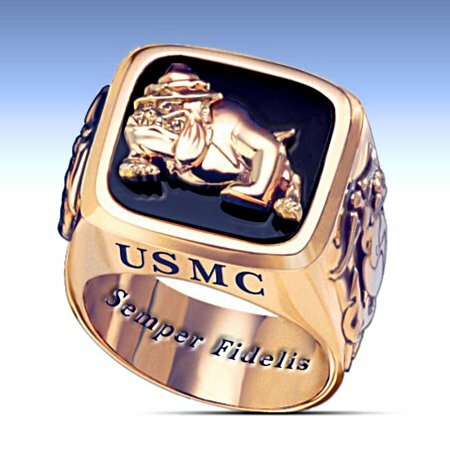 Introducing the USMC Semper Fi Chess Set, available exclusively from The Bradford Exchange, Hawthorne Village Division. Featuring handcrafted and hand-painted Marine-inspired game pieces, this USMC chess set is a one-of-a-kind tribute to the men and women who serve our country. 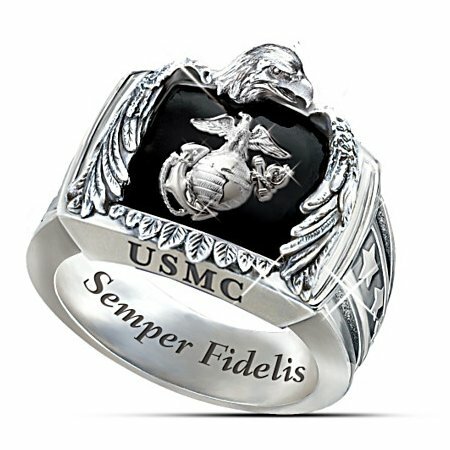 The fully-sculpted chess pieces proudly stand on gleaming metal bases and feature your Devil Dogs in Dress Blues, Service and Utility uniforms; CH-53E Super Stallion and AH-1W SuperCobra helicopters; and the official emblem of the Corps - the Eagle, Globe and Anchor. The grandly-sized wood chess board features game squares painted in shimmering metallic red and gold paint, and the borders are handsomely accented with raised-relief golden sculptures of the Marine Corps emblem, stars and braiding. Strong demand is anticipated for this USMC collectible chess set, so don't delay. Order now! There are few on Earth so deserving of a glass raised in their honor as the men and women who protect our country. 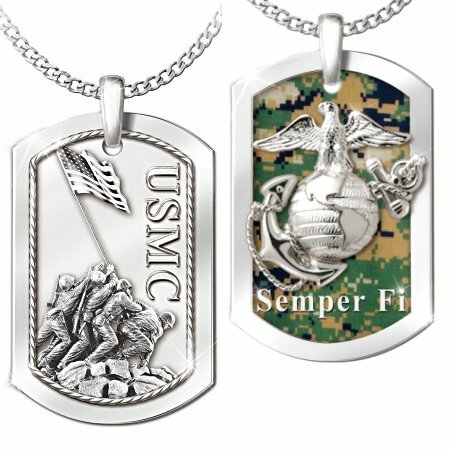 Marine Corps gifts honor those who serve and are a perfect way to express a heartfelt "thank you". This limited-edition Semper Fidelis Decanter Set, exclusively from The Bradford Exchange, features a USMC decanter and four glasses with patriotic Marine artwork by famed historical artists Glen Green and James Griffin. This officially licensed decanter set is a home bar must-have for the Marine in your life. Each of the four 10oz. glasses in this USMC glass set showcases vivid wraparound Marine artwork recreated in full color detail and faithful phrases in golden type. 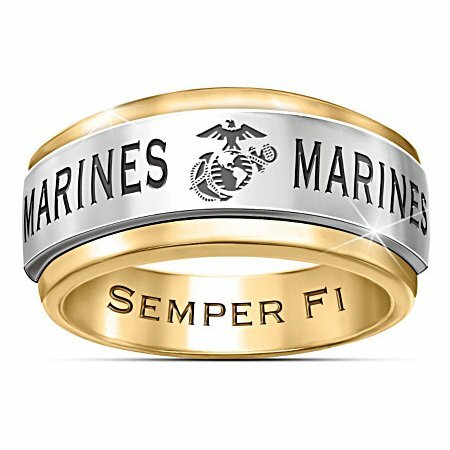 Embellished with golden-plated design elements and ringed in 12K gold, they're a great tribute to the men and women who have made the Corps great. A matching 25 ounce decanter is decorated with the official USMC Eagle, Globe and Anchor symbol plus the Marine motto, "SEMPER FIDELIS". A custom USMC topper completes the elegant presentation. For the perfect finishing touch, this five-piece Marine barware set arrives - and can be stored - in a distinctive, cushioned, satin-lined gift box. Strong demand is expected so don't delay. Order now! Raise a toast to the dedicated men and women of the U.S. Navy with a U.S. Navy decanter set that celebrates their bravery, courage and sacrifice. Introducing the limited-edition U.S. Navy Salute Decanter Set, available only from The Bradford Exchange. This handsome U.S. Navy glassware features four 10-ounce glasses richly rimmed in 12K gold and showcasing vivid wraparound artwork of naval action by acclaimed artist Dennis Lyall. 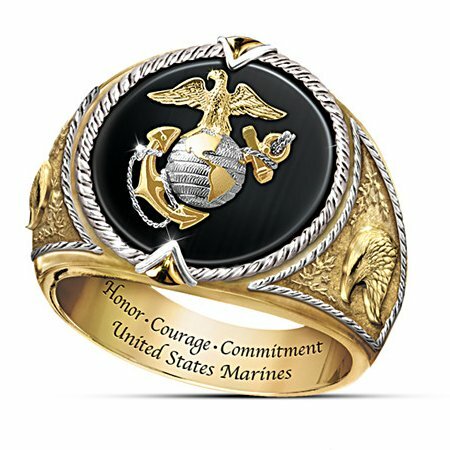 Emblazoned on each glass is a Navy core value: "HONOR", "COURAGE", "COMMITMENT" and "DUTY". The matching glass decanter bears a golden U.S. Navy emblem along with the words "HONOR COURAGE COMMITMENT" and holds 25 ounces of your favorite spirits. 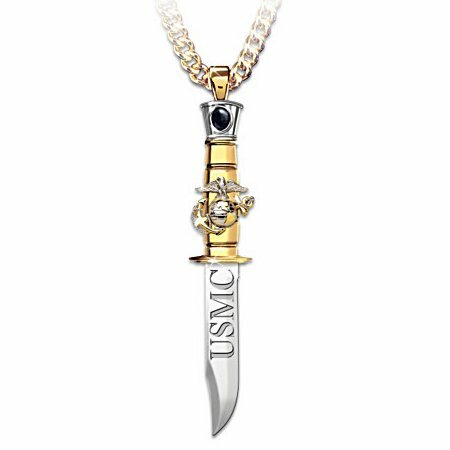 Rich 12K gold accents and a glass stopper that reads "U.S. NAVY" complete this handsome tribute. This five-piece U.S. Navy collectible decanter set arrives in a cushioned, satin-lined gift box. Strong demand is anticipated. So, don't delay. Order now! The U.S. Navy has a long and proud tradition that dates back to 1775. From the earliest days of the Revolutionary War, through the Persian Gulf War and elsewhere, they have always made the ultimate sacrifice when called upon. Now you can proudly demonstrate your support in this limited-edition U.S. Navy watch and own one of only 5,000 ever made. 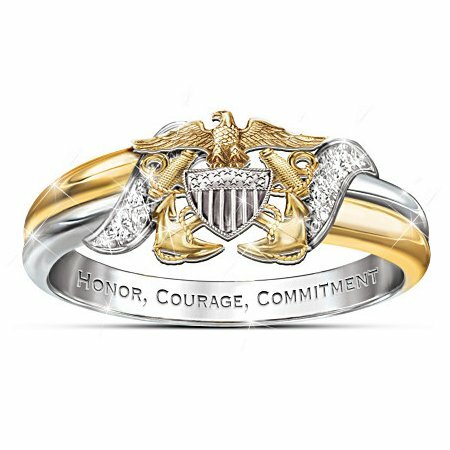 Saluting 235 years of honor, valor and glory, this bold U.S. Navy jewelry is available exclusively from The Bradford Exchange. Handcrafted in stainless steel, this dramatic U.S. Navy watch boasts a handsome bracelet style with a silver and gold-tone finish. The Navy dress blue watch face stands out, along with the Navy symbol of eagle, globe and crossed anchors, 3 chronograph subdials and a date window. On the side of your watch is etched "HONOR VALOR GLORY", while the custom etching on the case back celebrates the Navy's 235 year tradition, and displays your edition number in this limited edition of 5,000. Plus, you will also receive FREE fact cards that trace the history of the U.S. Navy and feature compelling art of the Navy in action. 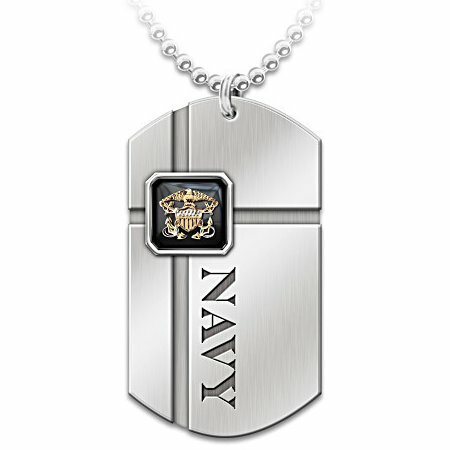 High demand is expected for this commemorative U.S. Navy jewelry, so don't delay. Order now!